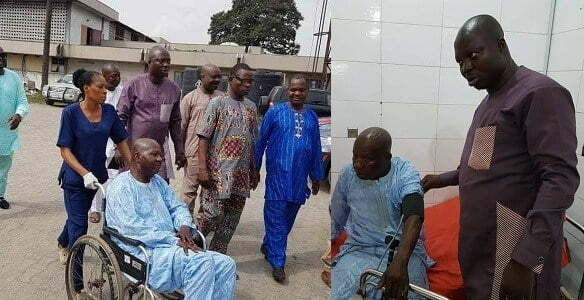 Babatunde Omidina popularly known as ‘Baba Suwe’ has been admitted at the Lagos University Teaching Hospital (LUTH) in Idi Araba, Lagos. Amusan, popularly known as ‘Mr Latin’ as his stage name, said that the development was as a result of the approval of the association’s appeal to the Federal Government to foot the medical bill of Baba Suwe. He said the ailing veteran comedian who was alleged to be suffering from an unknown sickness had been promised a first-class treatment by the Federal Government at LUTH. Amusan disclosed that the Minister of Health, Prof Isaac Adewole, had made arrangements for the comedian to be treated while the Federal Government will foot the medical bills. Amusan said, “Myself and other association members have just taken Baba Suwe to LUTH from his residence. ”I want to appreciate the minister for this gesture, we are happy that our colleague will be back on his feet after a comprehensive treatment. ”He is receiving first-class treatment and we feel so honoured. ”I also thank the Vice-President, Prof. Yemi Osinbajo, for his generousity, having donated N1m toward Baba Suwe’s treatment. ”As the new president of the association, the welfare of my members is paramount on my mind which I have determined to improve within my four years’ tenure”.